Purls and Pop-Ups is an annual yarn crawl that takes place in Whatcom County, WA. 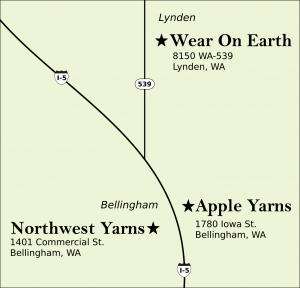 Begun in 2017, this yarn crawl focuses on the independently owned local yarn shops (LYS) of Whatcom County that enrich the fiber arts communities in our region. Purls & Pop-Ups not only focuses on yarn and the fiber arts, but also features pop-up shops at each LYS chosen from small businesses around the Northwest. Additionally, participants receive giveaways, can win prizes, and help support community organizations. We look forward to seeing you at the next Purls & Pop-Ups! Copyright © 2018-2019 Purls & Pop-Ups All rights reserved.